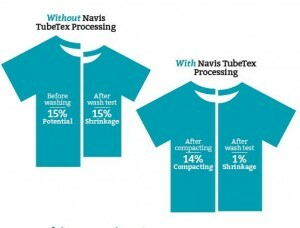 The Navis TubeTex TM-100 is a revolution in open width knit finishing. The machine is the culmination of extensive Engineering and Research efforts. Extensive uses of new materials and manufacturing techniques have produced a new machine that could not have even been produced just a few years ago. These engineering breakthroughs mean faster change over for fabric styles and higher quality while reducing running cost. 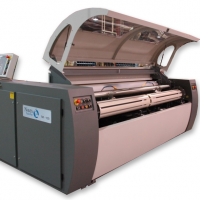 The machine will produce high quality outerwear and apparel knit fabrics with a softer hand, superior shrinkage control, width control, and yield control. An optional Automatic Width Control and Automatic Stitch Control devices are available for further ease of operation. The compaction section utilizes two rolls and one heated shoe to present the fabric into the compaction zone. 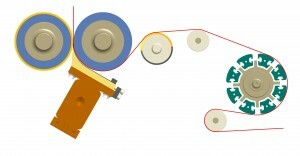 A feed roll overfeeds fabric while the slower retard roll holds the fabric in the compaction zone. By decreasing the retard roll speeds, the machine operator can reduce the length shrinkage and increase compaction up to 25%. When the process requires, Navis TubeTex can add a Pin Tenter Entry. The 12 meter Pin Tenter Entry incorporates Gumming, Infrared Selvage Drying and Selvage Trimming as required.